2018 NOTE: This Shuttle has been DISCONTINUED. In July 2017, the Vancouver Trolley Company merged with WestCoast Sightseeing. This seasonal shuttle has been discontinued. WestCoast Sightseeing has a hop-on/hop-off tour which has some stops in Stanley Park and some in the city of Vancouver. This hop-on/hop-off tour unfortunately has less stops in Stanley Park than the Shuttle had. On the other hand it operate in a similar manner and the historic-looking buses do operate on the hop-on/hop-off tour so you can still ride on them, but not every bus is the historic one. The Stanley Park Shuttle is a seasonal hop-on/hop-off bus run by the Vancouver Trolley Company. The shuttle runs seasonally from mid-June to early September. 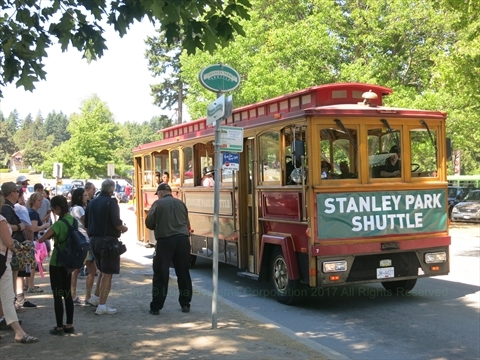 The Stanley Park Shuttle is a fully narrated 45 minute tour that stops at 15 locations in the park that are near the most popular attractions and locations. You can get on or off at any stop to explore a specific area or attraction of Stanley Park. There are well-marked bus stops on the road. You can purchase tickets on the bus or online. We recommend the shuttle tour if you want to spend half a day or a whole day exploring the park. Be aware that during the weekends, it can be very busy at times so you may have to wait to get on the shuttle. We recommend the shuttle tour if you want to tour Stanley Park on your own schedule and/or you don't have transportation and want to explore many attractions in one day! There are stops near the Stanley Park Information Booth, Totem Poles, Brockton Point, SS Empress of Japan Figurehead, Lumbermens' Arch, end of Ravine Trail, Prospect Point, Prospect Point Picnic Area, Hollow Tree, Ferguson Point, Ceperley Park, Lost Lagoon, Bus Loop, Miniature Train, and Vancouver Rowing Club. 2016 Hours of Operation: Daily 11am to 6:45pm, trolley comes by approximately every 30 minutes.